to compensate the difference in speed during the reel position change: the unit has a buffering capacity up to 6,5mt of filament is composed by 7 rolls, 3 of which capable of swinging in order to accumulate the filament keeping the tension by an electronic control adjustable from the control panel. complete of a double independents motorized reels for filament take up. 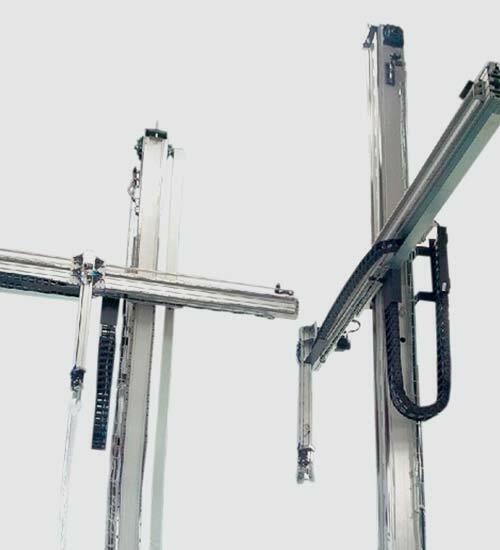 are composed by: ONE rotating wrapping device + TWO lifting arm complete with ONE clamp each (the TWO lifting arm are working on TWO independent pillars). The System works both with PE film and with PVA hydrosoluble film for concrete reinforcement application. is composed by TWO independent cutting units each one dedicated to serve one of the two lifting arms. A down stream system is composed by TWO dedicated slides for waste. Cutting speed up to 30 cuts/min. 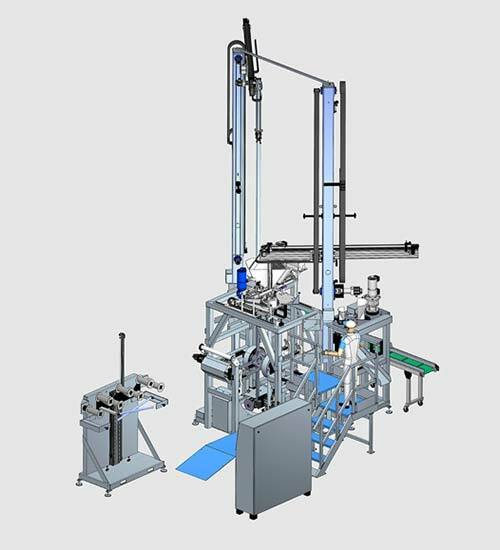 The AWWBC is a fully Automatic System winding, wrapping, cutting fiber pucks, working in line with the extrusion process. The tow of filaments coming from extrusion line is wounded on one of the two reels. Once the reel is full, the filament tow is driven on the other empty reel. The full reel is unfilled by a combined actions of rotating knifes (cutting filaments tow) and a lifting arm, complete of clamp for filament tow hanging. The lifting arm works in a combined action with a wrapping unit; the lifting/wrapping speed is adjustable by control panel. The hank is now wrapped with PE/PVA film. Once the hank is wrapped the lifting arm moves the hank to the automatic cutting station that is cutting the hank in pucks of defined height. A downstream system of slides is conveying the pucks to down stream equipments.